Utah metal garage kits and steel arch buildings custom manufactured in The Beehive State for small business, commercial and residential use. Utah metal garage kits by Metal Building Kings® are pre-engineered building systems are guaranteed for 40 years. Buy Utah metal garages, steel arch buildings and metal garage kits at Metal Building Kings® at prices factory direct to the consumer. Get a quick quote on your custom metal garage kit by using our pricing calculator or our discount garage kit calculator. Utah businesses and residents can also check out our sale prices for metal garages in stock and ready to ship. Metal garage kits designed specifically for the State of Utah and carry a 40 year guarantee. Each garage kit is custom made with your choice of 14 to 22 gauge 80,000ksi tensile yield carbon steel coated with aluminum-zinc alloy and silicon. The special silicone-protected polyester coil coating system paint used on all Utah metal garage kits is formulated especially for Metal Building Kings® steel buildings with your choice of 5 colors from Fern Green, Galvalume Silver, Polar White Lighstone and burnished slate. All colors applied to your garage kit are Energy Star and LEED compliant. If you want a custom color let our staff know and we can have it mixed for you. Metal Building Kings® distribution centers, located in Utah's cities include Salt Lake City, Provo, West Jordan, South Jordan, Sandy, Taylorsville, Millcreek, and St. George receive your custom kit from our factory and deliver it to your construction site. Your delivery will be expedited within 3 days and includes all the building's components and instruction manuals. Metal Building Kings® delivers building kits throughout the state's to 2.995 million residents in 29 counties. You can view our metal garage models here which have 4 distinct styles of arch roof designs and side walls. All straight end walls are customizable to accommodate our custom walk and overhead doors and windows. 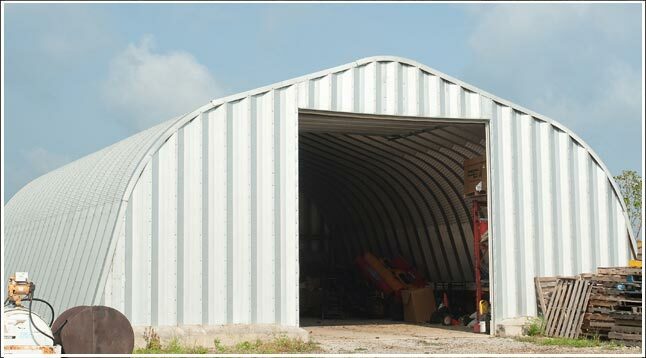 7.5 " deep corrugated, ribbed arched panels that your garage kit is constructed with are roll formed at our factory. Each arch is is 2' wide and overlap each other when fastened with 2 rows of grade 8 commercial bolts for strength and certification in continents all around the world. The metal in your arch building is AZ Galvalume® steel which is 700% more rust resistant than galvanized steel used in other types of buildings. Your building length can be as long as you want in 2' increments. Custom Utah metal garage kits are customizable from 3' to 6' wide for workers or small equipment to pass through and 1.75" thick. All doors are built into your garage's end walls and constructed with18 to 20 gauge electro galvanized steel sheets. Standard knock down doors are common with garage kits but commercial grade doors are available that withstand up to 160 mph winds. Your main entrance used for vehicles can be custom sized up to 48' wide to 28' high. Choose your custom electronic roll up, sectional, or bi-fold overhead door or a manual sliding door for horse barns. Doors can come insulated and are made of 16 gauge to 26 gauge reinforced steel. Your entire building if you choose, can be insulated as well by 3 methods. 1) Spray foam 2) Roll fiberglass insulation, or custom insulated arch panels to keep your interior at a regulated temperature and guard against condensation. Customize your Utah metal garage with your choice of different models of gravity, turbine or ridge vents that are built right into the building. Install louver vents on the side walls for cross ventilation. Utah's distribution industry houses billions of dollars in products for shipment across the United States and our clients buy metal building kits to hold or store products ready to ship. Warehouses across the state that need maximum protection utilize metal buildings for their solid steel, expansion ability and mobility. Metal garage kits and steel buildings are popular in Utah for workshops, warehouses warehouses, truck storage and equipment storage facilities and for both business and residential use because they are certified as the best pre-engineered building system to withstand wind storms up to 170 mph winds and earthquakes. Steel arch buildings are secured right into the cement foundation with steel base plates and bolts that secure the structure in place to withstand seismic activity like no other prefabricated or pre-engineered steel building can. Utah customers value our ability to manufacture steel buildings efficiently so we can offer factory direct prices which are among the least expensive of all comparable types of metal garage kits and sellers of arch buildings. Be sure to check out our clearance sales going on that have in-stock buildings and garages at discounted prices. Also learn more how your Utah metal garage is priced out by visiting our pricing page. Every metal building is custom manufactured to Utah's specific codes and certifications. Read here for more on Utah building codes. • The P Model for Utah workshops, residential and small business. One you have custom designed your garage kit and placed your order Metal Building Kings® can send you the required documentation you need for permits and inspections such as blueprints, floor plans, materials and component specifications. Our Turnkey services are here to help you with land surveys, erecting your building, and laying your monolithic foundation by recommending the right subcontractors who specialize in metal buildings. We can provide everything you need from planning to construction. Access our statewide network of sub-contractors we have worked with in Utah who are licensed and certified.